Having neglected my basic education for too many years, I thought it would be useful to get a little more up to speed on population genetics, seeing that it is the firm foundation of the Neodarwinian synthesis that currently rules the world. So I downloaded some evidently bog-standard teaching material from a handy New England University which seems to form a good basic introduction. The famous Hardy-Weinberg equation, the accepted mathematical underpinning of evolution, is easy to understand and pretty self-evident. So now I’m a biologist. I finally deserve the distinction in Scholarship level zoology I got at school. Macroevolution is simply a consequence of microevolution occurring over many generations until a single species changes so dramatically in phenotype that it is classified as a new species. Evolution refers to a genetic change over time, but what kind of a genetic change? It certainly does not refer to a change in genes themselves because this type of genetic change is called a mutation. Species also change over time and if such change is a consequence of a change in their genes, then species change constitutes evolution. But species evolution, also called macroevolution, takes thousands of years and is studied by paleontologists, not geneticists. Do you see what is being said here? I love it. Evolution properly deals with gradual non-mutational changes over periods less than thousands of years. Outside that time, “It’s not our business but the palaeontologists.” Now since Darwin’s time palaeontologists have been troubled by the fact that the fossil record does not show gradual change, but long stasis followed by relatively sudden change. But what they study is rocks, not molecules or living organisms, so historically any theory of speciation has had to come from the geneticists – who say it’s outside their field. They simply offer their cast-offs, and (I’m told) criticise palaeontologists for not being proper biologists themselves. Herein, surely, lies the root of much of the rivalry and compartmentalisation of ideas that any outsider can see within biology to this day. As has been rightly pointed out, Neodarwinism should properly be called Neomendelism. Darwin (like the vast majority of lay people) was interested in the origin of the vast range of species we see over a huge period of time, and called that process “evolution by natural selection”. Mendel, by contrast, studied how populations change from one generation to the next. This is, by definition, the field of interest for the Modern synthesis, which has all but defined away Darwin’s use of the term evolution. It was certainly a triumphant rehabilitation of natural selection to incorporate it into a large scale statistical application of Mendel’s genetics – but Darwinian evolution it ain’t. Does it matter? Well, maybe not for much longer. New mechanisms are being studied for the interesting bit of evolution, which is the pageant of life. The role of all those allelic frequencies is due for review too, because in order to pin down their role in evolution, one needs to study their effects over an extended time. The actual title of my introductory download was “Evolutionary Stasis and the Hardy-Weinberg Principles” and showed how, depending on the circumstances, those principles could actually stop evolution occurring over the long term. 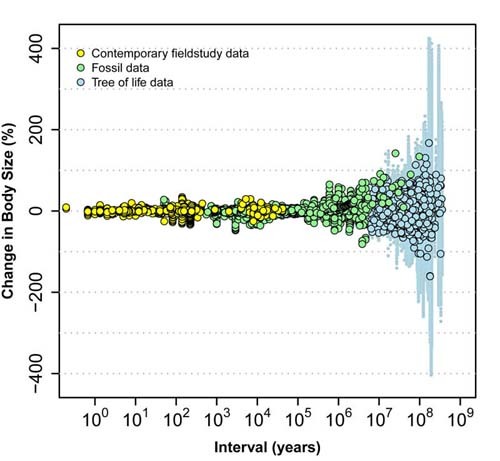 Here is the key graphic from the recent paper by Josef Uyeda et al which suggests very strongly, from a meta-analysis of studies, that microevolution is a highly reversible process, and that large changes only kick in at times over 1M years or so. The effect of the graphic is exaggerated by the log time scale, but still apears real enough. In other words, permanent evolution does not generally occur from the processes of population genetics, and some other process or processes must be at work to explain the bulk of change we see in the world. The overall pattern over the timescale of microevolution is stasis – so natural selection is a stabilising, not an innovative, process. So if you want to understand how the real stuff happened, better fire your population geneticists and hire a palaeontologist.